Need a gift for an employee, customer, friend, or family member? Give them Coffey County Chamber Bucks! These gift checks can be used to purchase merchandise, products and services at most businesses in Coffey County Kansas. Please help support keeping shopping dollars in Coffey County by purchasing Coffey County Chamber Bucks. What Are Coffey County Chamber Bucks? Coffey County Chamber Bucks can be used for any occasion, birthdays, anniversaries, weddings, employee incentives, achievement awards, or holiday bonuses. These gift checks can be redeemed at most Coffey County businesses for whatever the recipient desires. Please ask the merchant prior to making your purchase if they accept Chamber Bucks. Why Should I purchase Coffey County Chamber Bucks? Your Coffey County Chamber of Commerce is working hard to keep shopping dollars in Coffey County. Coffey County Chamber Bucks strongly encourages people to shop locally which, in turn, supports business growth. Where Do I Get Coffey County Chamber Bucks? between 9:00 a.m. and 2:00 p.m. on weekdays. Please call ahead for orders to ensure timely completion. Value of Check is guaranteed by the Coffey County Chamber of Commerce. Contact the Coffey County Chamber of Commerce at 620-364-2002 for additional information! 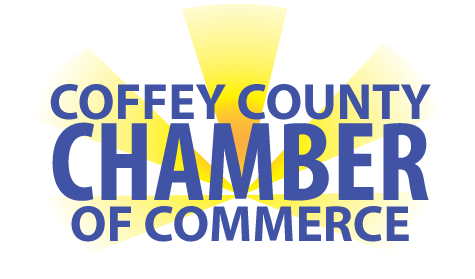 Thank you for supporting Coffey County Chamber Bucks!